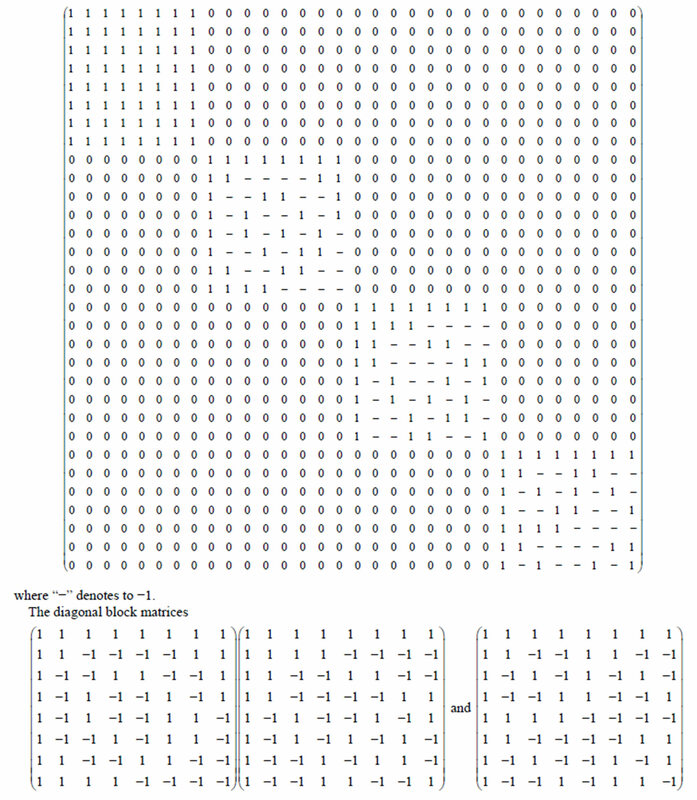 In this paper, we investigated the code over which is generated by the incidence matrix of the symmetric (2,4) - net . By computer search, we found that this binary code of has rank 13 and the minimum distance is 8. A design is an incidence structure with points, points on each block and any subset of points is contained in exactly blocks, where . the number of blocks is and the number of blocks on a point is . The design is resolvable if its blocks can be partitioned into parallel classes, such that each parallel class partitions the point set of . Blocks in the same parallel class are parallel. Clearly each parallel class has blocks. is affine resolvable, or simply affine, if it can be resolved so that any two nonparallel blocks meet in points, where is constant. Affine 1-designs are also called nets. The dual design of a design is denoted by . If and are both affine, we call a symmetric net. We use the terminology of Jungnickel  (see also [2-5]). In this case and . That is, is an affine design whose dual is also affine with the same parameters. For short we call such a symmetric net a -net. If is a symmetric net we shall refer to the parallel classes of as block classes of and to the parallel classes of as point classes of . For any finite structure with point set and block set , the code of over prime field is the subspace of the space of all functions from to that is spanned by the incidence vectors of the blocks of . This code is equivalent to the code given by the column space of any incidence matrix of the incidence structure, where we use the blocks to index the columns (and the points the rows) of the incidence matrix. Its incidence matrix is (1). 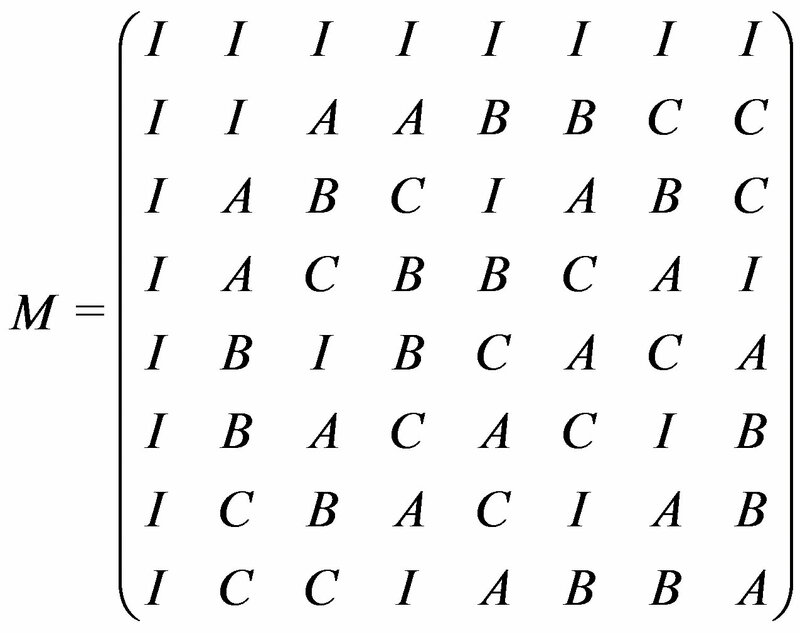 A computer search has shown that to within isomorphism there is only one symmetric net with these parameters. We denote this symmetric net by . Butson  showed that there exist symmetric nets with any prime and This was extended to any prime power by Jungnickel . Therefore is one of the family of symmetric nets constructed by Jungnickel. 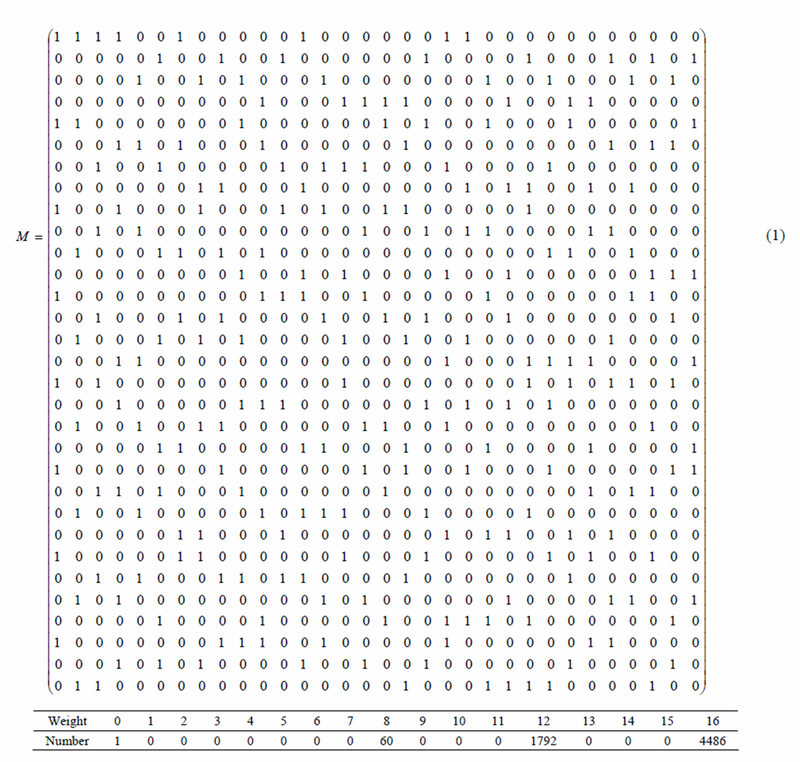 The columns of the incidence matrix of can be considered as vectors of the 32-dimensional vector space over any finite prime field The subspace they generate is the code of the net over By computer we found that the binary code (that is, the code over the field of order 2) of has rank 13. The weight distribution of its codewords is given below. 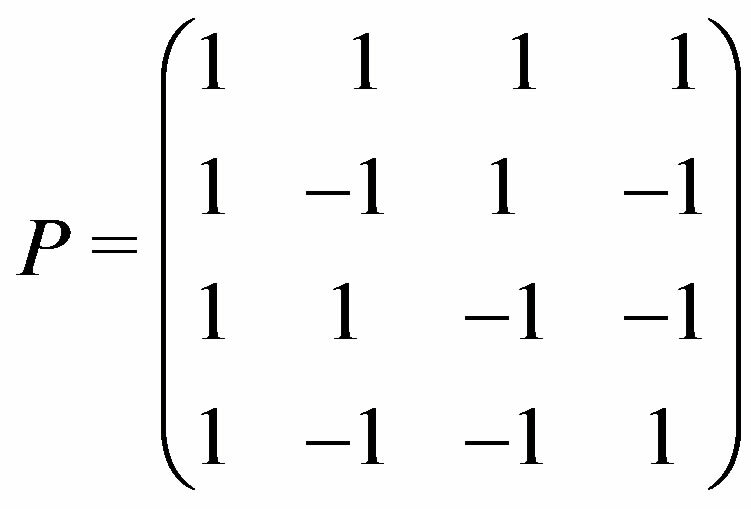 The all one vector is in the code since it is obtained as the sum of the 4 columns corresponding to the blocks of any parallel class in the incidence matrix. Therefore the code is self-complementary in that the complement of a codeword is also a codeword, see  or . Hence we only list the number of codewords of weight up to 16. Since the minimum distance is 8, the binary code is 3-error correcting. There doesn’t seem to be an easy proof that the dimension of the code is 13 over the binary field. The dimension of the code of for odd characteristic is 25. This we prove in this paper. is an elementary abelian group of order 4. First suppose that the characteristic of the field is not 2.
have determinant 4096. In fact they are Hadamard matrices. Hence the rank of is , if the characteristic is not 2. The author would like to thank the Deanship of Scientific Research at King Abdulaziz University for supporting a project no. 169/428, where this paper is a part of that project. T. Beth, D. Jungnickel and H. Lenz, “Design Theory,” Cambridge University Press, Cambridge, 1999. C. J. Colbourn and J. H. Dinitz, “The CRC Handbook of Combinatorial Designs,” CRC Press, Boca Raton, New York, London, Tokyo, 1996. Y. J. Ionin and M. S. Shrikhande, “Combinatorics of Symmetric Designs,” Cambridge University Press, Cambridge, 2006. E. F. Assmus Jr. and J. D. Key, “Designs and Their Codes,” Cambridge Tracts in Mathematics, Vol. 103, Cambridge University Press, 1992.